Last night, while praying with my family, and discussing the Proverbs, my seven-year old daughter reminded me that she wanted to read the Proverbs too! Convicted, I realized this was the second night in a row that she had mentioned it to me, and that I had not included her when I had invited my family, friends, and readers; to read a Proverb a day during Lent. 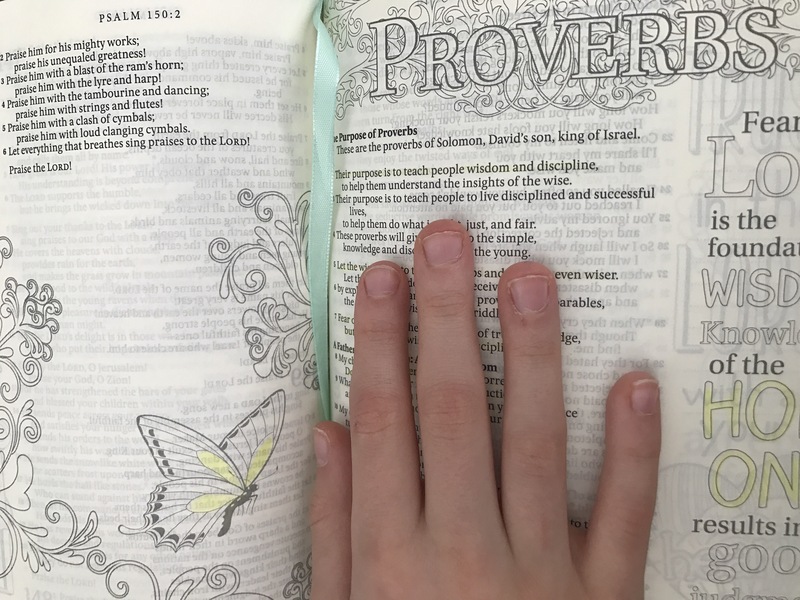 Though we were reading her bible stories, I had not thought about taking her on this journey of gaining wisdom through my favorite book of The Holy Bible: Proverbs. My heart was touched by my child’s yearning to grow even more in wisdom, knowledge, and understanding. She wanted to learn more about God’s promises,and His commands which protect us, and keep us from going down the wrong path. I read a few to her and explained them, while promising to find her a children’s book of Proverbs, because she also likes to read by herself. My young artist’s eyes lit up, as her little fingers reached for the thin pages of my coloring bible, as she realized she could also draw and color, while reading her way through the scriptures. I realized I needed to get her a coloring bible too! I was filled with joy, as I took in the truth: Even with all my imperfections, my child is watching me walk with Jesus, and making the choice to walk with him too. Our family found out she knew Jesus, and already had a relationship with him, while she was yet only the tender age of three years old. My daughter showed a gift for discerning and understanding scriptures, forgiving easily, and comforting others by perceiving their pain, along with ability to melt it away; even before her preschool years. She has wisdom beyond her years, and it is not credited to me; it is because God has given her these beautiful gifts. I marvel at them, just as I do at the gifts he has given to my twin boys, who are now young adults, and just as I see gifts within the children of my friends, and the children who have attended my Sunday school classes. The Proverb I read to my daughter last night happened to be: “These proverbs will give insight to the simple, knowledge and discernment to the young. let the wise listen and add to their learning, and let the discerning get guidance–for understanding proverbs and parables, the sayings and riddles of the wise” (Prov. 1:4-6 New International Version). Never assume someone is too young to follow Jesus, for the innocence of children is clean and pure. They don’t have the dirt and lies of the world to spoil their view, so they can see truth and love more clearly. Share God’s wisdom, truth, and love with a precious child today! “My child, listen to what I say, and treasure my commands. Tune your ears to wisdom, and concentrate on understanding. Cry out for insight, and ask for understanding. Search for them as you would for silver; seek them like hidden treasures. Then you will understand what it means to fear the LORD, and you will gain knowledge of God” (Prov. 2:1-5 New Living Translation). Every once in a while Gabriel says something that is so wise for his age I am shocked. And then I’m surprised that I didn’t think of it myself! They truly are never too young.